This column first appeared on johnshelbyspong.com on Dec. 1st, 2016. It is re-posted here with permission. When I learned of your stroke in September, I was en route to the fourth Common Dreams Conference in Brisbane, Queensland. Having no details at that point and being a half-a-planet away, I was anxious about having to endure the uncertainty of this news on my own. I needn’t have worried, though. As it turns out, I couldn’t have found myself in a more supportive and equally concerned crowd anywhere in the world. Few people know as well as you the peculiar feeling of being both reviled and beloved around the world. But it seems to me that nowhere are you more respected than in Progressive Christian circles Down Under. I look back with fondness on the inaugural Common Dreams event in Sydney back in 2007. Although it wasn’t your first trip to Australia, CD1 was a seminal event I feel fortunate to have attended. As you’ll recall, when news broke that this “rogue heretic” (that would be you) was once again descending on Australia, the Archdiocese of the Sydney Anglican Church sent out a press release banning you from setting foot on any Anglican property while in their city. This was, of course, the best publicity the organizing committee of Common Dreams could have ever hoped for. I recall the delight (tinged with sadness) you expressed in having your infamy splashed across the pages of The Sydney Morning Herald. While providing further proof to the non-religious that the church (or at least the Sydney Anglican Church) was hopelessly irrelevant in its obsession with the past, your notoriety resulted in interviews and other media exposure that drew a crowd exponentially larger than expected. I remember your presentations being both inspiring and encouraging to a crowd that was yearning for new directions. Looking back, your trademark tenacity in the face of controversy seems to have been one of the catalysts for what continues to grow as a broad and evolving network of Progressive Christians in Australia/New Zealand. And so it goes – all across the globe – a legacy of certainties called into question, death-dealing dogmas called out, exclusive and privileged institutions put on notice. You are at one and the same time one of orthodoxy’s worst nightmares and a cup of cool water to the beloved community of “church alumni/ae” – and all of this with a focus, a grace, and a humility that confounds your critics. Our attendance that summer was the highest The Fountains had ever had – with lots of first-time attendees who had never heard of “Progressive Christianity” before their pastors started preaching against it. It remains to be seen what the long-term effect of this episode will have on people’s overall impression of Christians. I fear that for many, witnessing a gang of conventional Christian churches essentially bullying a theological minority was just more proof that the American practice of Christianity is hopelessly damaged and irredeemable. In fact, Jeremy Greaves (the Venerable!) and I were just reflecting on that sentiment earlier today. You might remember that Jeremy is serving as the Rector at St Marks, Buderim and the Archdeacon for his area of Queensland. We were Skyping today about his having been chosen to become the new Assistant Bishop in the Diocese of Brisbane. No sooner had the announcement been made than the denunciations began — including enough hateful phone calls that Jeremy is considering changing his phone number! Jeremy’s friends outside the church see this all happening and say, “Really?! ?” They’re bewildered because they know the sort of person Jeremy is and don’t care much about what doctrines he holds to be true. It simply confirms the suspicions they’ve had about the church and Christians for most of their lives. So for Jeremy, Jeff Procter-Murphy, me, and so many others like us, you remain a profoundly important role model. Despite all its flaws, its backwardness, and downright mean-spiritedness, we are still drawn to the promise of “the church” and its potential to be a force for good in the world. We resist the urge to throw up our hands in frustration or sink into a funk of inaction. We have seen in you the example of one who refuses to abandon the church to those who would turn back the clock and leverage the institution to legitimate their fears and prejudices. The challenge for many Progressives, both clergy and laity, is daunting: to stay in the institution and not be broken by it. In you we’ve seen what it takes and are inspired to rise to the challenge. No matter how controversial, it is crucial for those of us who are clergy to follow your lead in translating the often esoteric theological musings of academia into language that is both understandable and relevant to thoughtful lay people. We need to muster the courage to be outspoken social critics, ecclesiastical whistle-blowers, and prophetic voices calling discrimination and injustice what it is, even in the face of a persistent status quo. All the while being able to express a genuinely pastoral ethos in the advocacy of the most radical of ideas. Sheesh. I don’t think you realize how high you’ve set the bar for us. And that doesn’t even begin to acknowledge the challenges posed by our presidential election. What’s a self-respecting Spongophile to do? How do we face the coming whirlwind of priorities, policies, and actions that discredit, disrespect, and cast disdain on the very people and ideals that you’ve spent a lifetime defending? Over and over again, you’ve reminded us that Jesus’ call is for us to be whole and real, not religious; loving, not moral and righteous; inclusive, not hating everybody that disagrees with us and claiming superiority over them. You’ve proclaimed it wherever there are ears to hear: the mark of Jesus’ disciples is to be loving. A call to life. A call to love. A call to be all that we can be. And that’s really the motive for this note to you – expressing my gratitude (and maybe a little aggravation!) at your having pointed out SO many places that need to be pushed to keep things moving forward. It is downright daunting. But perhaps one of the things I’m most grateful for is your expectation of not just me, but of all of us, clergy and laity alike. It’s a kind of unspoken summons where, in so many different circumstances, you have demonstrated the importance of standing up and speaking out — not just as “professional” public theologians, but as informed lay people in particular. I’ve seen it at work. It happens around kitchen tables and in coffee shops, on long drives and quiet walks where conversations turn to the things that really matter in life – and often those “things” are weighed down by the burden of long obsolete religious ideas and assumptions. Through your books, lectures, and columns, you provide the vocabulary and give permission to ordinary people to struggle, doubt, and even reject the dogma of their birth. You’ve opened new spiritual vistas for them. You’ve shown the power of simply sitting with and encouraging the hurting and the fearful without burdening them with platitudes or the weight of long-irrelevant theologies. And taking all of it together and holding it up to the light, one of your greatest gifts becomes clear: the ability to stir even those who consider themselves the “least of these” into action. Let’s be honest. People cannot not have an opinion about Jack Spong. Whether you’re stirring people up to totally reevaluate everything they’d ever thought they knew or steeling a Fundamentalists’ resolve to maintain the status quo, your life and teachings demand a response. And THAT’S what I’m going for. That’s a legacy worth pursuing. And insofar as I’m able to achieve even the tiniest sliver of that goal, I can say without hesitation that it is all your fault. Working with Jeff to develop Living the Questions has had a lot of unexpected benefits, not the least of which has been your friendship and mentorship. I will always be grateful for your wisdom, your support, and your encouragement. I look forward to connecting with you and Christine in person sometime soon. In the meantime, best wishes to you in your continued recovery. We who seek to live, love, and be all that we can be offer our love and gratitude! PS: Tell Christine I’m grateful for her encouraging note. She must be taking lessons from you. All it said was, “We hope you are still raising a ruckus!” Tell her she can rest assured, there’s plenty to raise a ruckus about. I’m on it! Thanks to the Rev. Dr. Jeff Procter-Murphy, the Venerable Jeremy Greaves, and Penny Davis, Director of the Arizona Foundation for Contemporary Theology for their input. David Felten is a full-time pastor at The Fountains, a United Methodist Church in Fountain Hills, Arizona, a musician, and with Jeff Procter-Murphy, is one of the co-creators of Living the Questions. He is also a co-founder of the Arizona Foundation for Contemporary Theology and a founding member of No Longer Silent: Clergy for Justice, an outspoken voice for LGBTQ rights both in the church and in the community at large. Walter Brueggemann is William Marcellus McPheeters Professor of Old Testament Emeritus at Columbia Theological Seminary. He is the world’s leading interpreter of the Old Testament and is the author of numerous books, including Westminster John Knox Press best sellers such as Genesis and First and Second Samuel in the Interpretation series, An Introduction to the Old Testament: The Canon and Christian Imagination, and Reverberations of Faith: A Theological Handbook of Old Testament Themes. Ten years ago, the real world needs of two United Methodist pastors in Arizona led to the development of a DVD and web-based curriculum designed to help people wrestle with the relevance of Christianity in the 21st century. The result was Living the Questions, a program designed to help people wrestle with basic spiritual and theological questions often avoided by the Church. Now an entire catalog of DVD curriculum and resources, Living the Questions seems to have struck a nerve. Today, over 6,000 churches around the world use LtQ curriculum as a catalyst for asking important questions about where the church is going and the part each of us has in the process. To celebrate the ten year anniversary of material that has been called both “inspiring” and “transformational,” Living the Questions has released A NEW CATALOG FOR 2015. Distributed as an insert in a recent volume of The Christian Century, we offer it here as a pdf file for your perusal. Thank you for your continued support and encouragement. We look forward to the next ten years of “Living the Questions” together! Save 50% on Saving Jesus Redux Curriculum Edition now through Tuesday March 24th when ordering online at www.livingthequestions.com! Ever feel like Jesus has been kidnapped by the Christian Right and discarded by the Secular Left? Saving Jesus Redux is total revision of Living the Questions’ popular 12-session DVD-based small group exploration of a credible Jesus for the third millennium. New contributors including Brian McLaren, Diana Butler Bass, and Robin Meyers join Marcus Borg, Walter Brueggemann, John Dominic Crossan, Matthew Fox, Amy-Jill Levine, and a host of others for a conversation around the relevance of Jesus for today. The 12-session curriculum edition program includes a printable participant reader/study guide with background readings and discussion questions. The basic format for each 1 – 1½ hour session includes conversation around the readings, a 30-minute video segment and guided discussion. Saving Jesus Redux Curriculum Edition is licensed for small group use and includes a two-disc DVD set and one year renewable subscription to the downloadable study materials. List Price = $250.00 plus s/h. Use coupon code SJR5CC before March 24th to receive 50% off the list price. Please Note: You must be logged in to your member account when placing your order/entering the coupon code for the coupon code to be recognized and the discount to be deducted. If you do not have a member account set up, please do so at Create an Account prior to placing your order. You are welcome to share this offer with others. 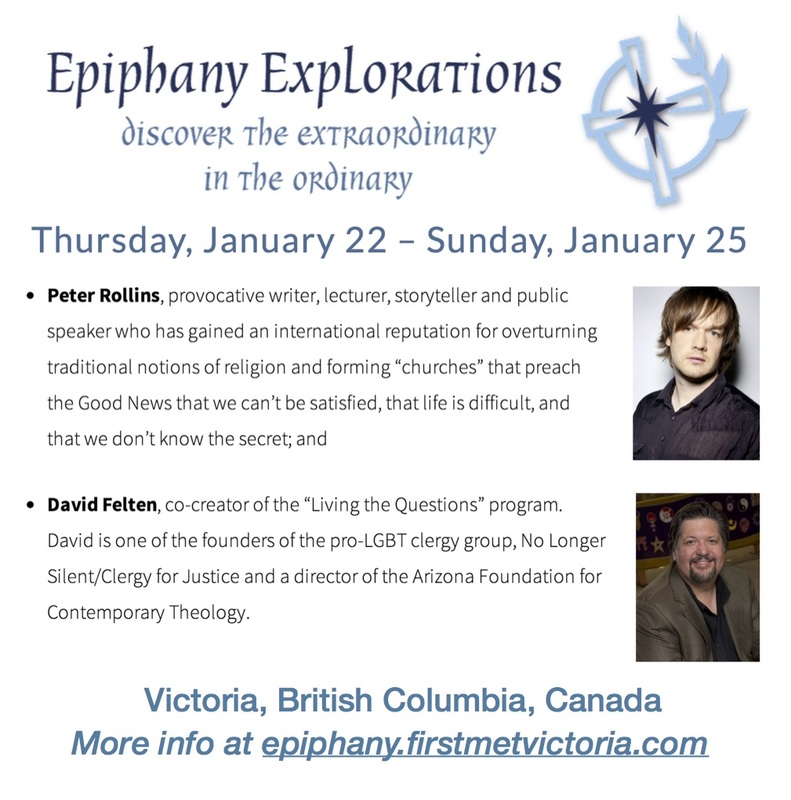 David Felten, author and co-creator of Living the Questions, joins author, storyteller, and professional firebrand Peter Rollins presenting keynote addresses at this year’s Epiphany Explorations in Victoria, British Columbia. Since 2003, First Metropolitan United Church has organized this eclectic mix of presentations, music, and visual arts. The conference includes stimulating and provocative presentations by prominent theologians, authors and writers from many Christian denominations, as well as speakers on social justice issues. Topics include church renewal, recent findings of theological scholarship, contemporary understandings of faith, as well as opportunities for spiritual nurture. With the recent terror attacks in Paris and Africa, it becomes all the more important to be vigilant in not letting Radical Islamists destroy the reputation of Islam. Creating a world at peace requires seeking understanding and building relationships with those whom we may not have had much interaction — especially those who are dehumanized and excluded by voices of hate and bigotry. The Jesus Fatwah is a five-session DVD and web-based series that will introduce you to Islam through input from both Muslim and Christian scholars and provide a reader’s guide that will help you gain a broad understanding of what Islam is, what it’s not, and how you and your community can resist the urge to demonize your Muslim neighbors out of fear and unfamiliarity. One of the contributors to The Jesus Fatwah is Dr. Rami Nashashibi, Visiting Assistant Professor in Sociology of Religion and Muslim Studies at Chicago Theological Seminary and Executive Director of Chicago’s Inner-City Muslim Action Network (IMAN). Named one of the “500 Most Influential Muslims in the World” by the Royal Islamic Strategic Studies Center, Nashashibi is a straight-forward and passionate voice of reason in the midst of often heated Islamophobic arguments. In The Jesus Fatwah, Nashashibi offers insights into the practice of Islam that are a catalyst for conversations about the common values held by Christians, Muslims, and Americans of all faiths. Anybody know a good Christmas carol based on Mark’s version of Jesus’ birth? You don’t? Well maybe we should write one! How’s this? at home with a midwife’s coax. Where else could it have been? No father’s name is given. So whaddya say? Do you have a verse or two in you? We’re looking for a progressive theological perspective, inclusive language, and acknowledgement that Mark didn’t know a thing about Jesus’ birth (unusual or not). Post your entries on the Living the Questions Facebook page and we’ll choose a favorite (using highly subjective criteria). The winner(s) will receive a free copy of our children’s Christmas Pageant program, “Matt and Lucy’s Version Births.” Let’s hear what you’ve got!